Pioneers in the industry, we offer pr fashion launched beautiful designer designer lehenga suit from India. 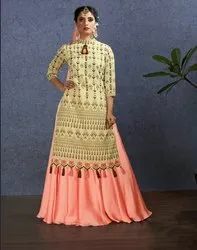 Rich And Elegant Looking Designer Lehenga Suit Is Here In Beige Colored Top Paired With Very Pretty Peach Colored Lehenga And Dupatta. Its Top Is Fabricated On Chanderi Paired With Satin Georgette Lehenga And Chiffon Fabricated Dupatta. Buy This Designer Piece Now.